← To segregate, or not to segregate? I’ve just come back from a far too short trip to the Netherlands, staying for a couple of days in the wonderful city of Utrecht. Having read – jealously! 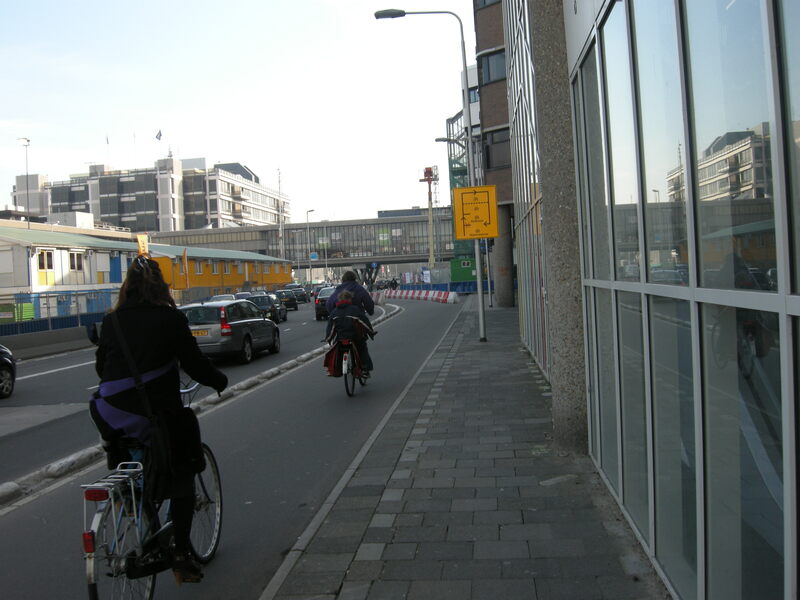 – about the conditions for cycling in the Netherlands on David Hembrow’s excellent blog, I went with pretty high expectations about what I would find, and I have to say, I was not disappointed. It was a massive eye-opener, and frankly coming back to the UK and immediately experiencing the fairly degraded conditions for cycling in the area where I live was fairly depressing. 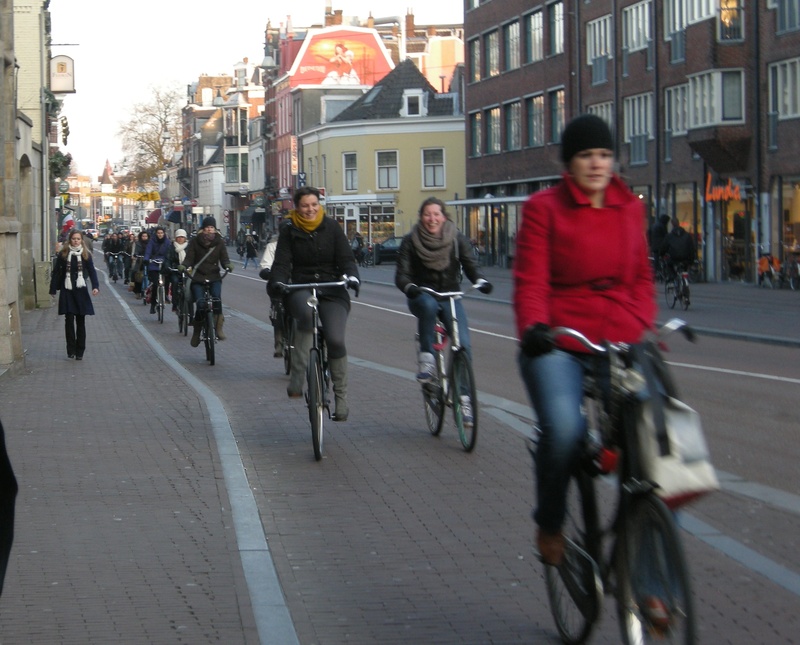 If I had to describe succinctly how cycling in Utrecht appeared to me, I would say that it is simply a different form of walking – a slightly faster one. There was no real distinction between the types of people walking, and the people cycling. Not in their clothes, nor in their ages or gender, nor in the way they talked to each other, nor in the way they seemed relaxed while moving about the city. Everybody appeared to cycle, and they do it easily, in normal clothes, and from door to door, chatting and smiling as they progress. Cycling looked, and felt, easy. Here are two children arriving in the centre of the city, on Mariastraat. Their mother was cycling with them. 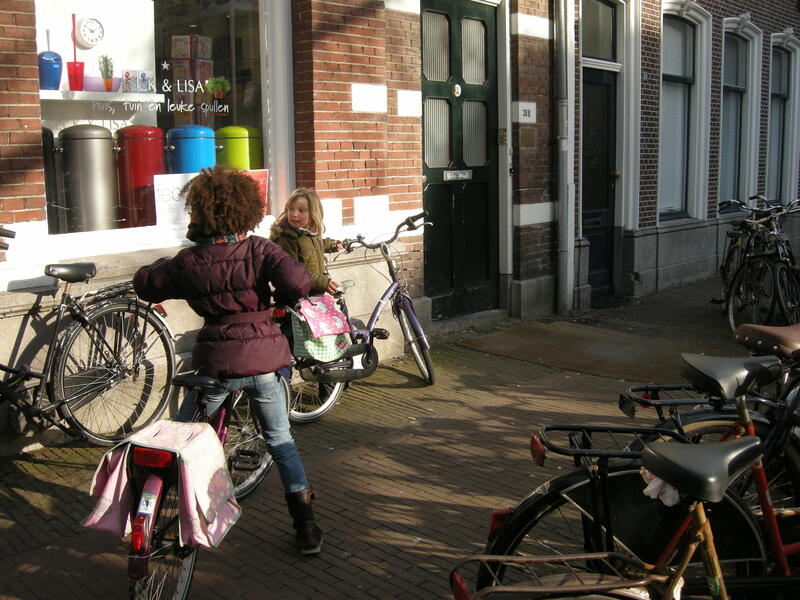 A father with his young daughter on his handlebars, two young children cycling with him. A father with his children. Note, again, the sheer ordinariness of the people on these bikes. This is what it is all about. It’s about making cycling the natural thing to do. I suspect that is why cyclists and pedestrians mingled quite easily, even on busy shopping streets; this was something that I had not really been expecting. 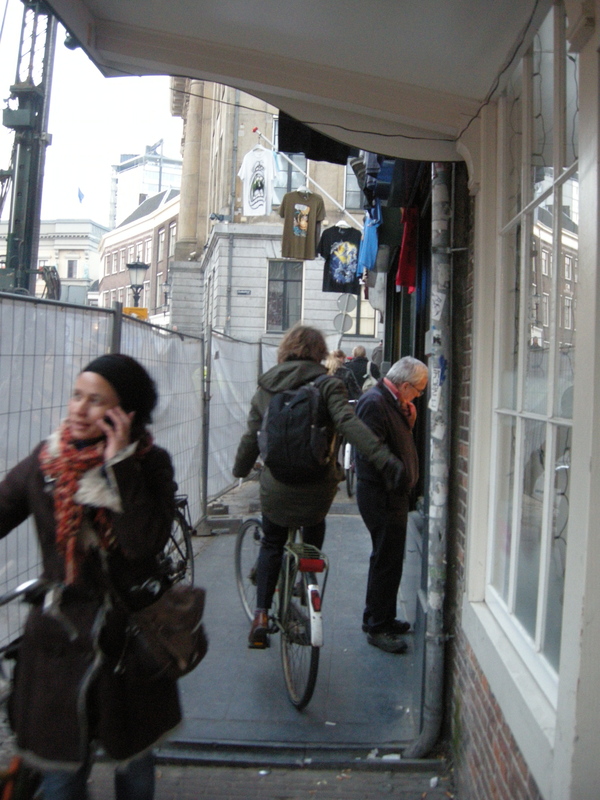 Even on narrow passageways between building works around the Old Canal, many cyclists did not dismount, and simply negotiated their way past pedestrians. Again, try to imagine someone cycling like this – even ultra-cautiously – in the U.K., where cyclists seem to be irrationally viewed as the ultimate urban menace, who need to be kept away from pedestrians at all costs. 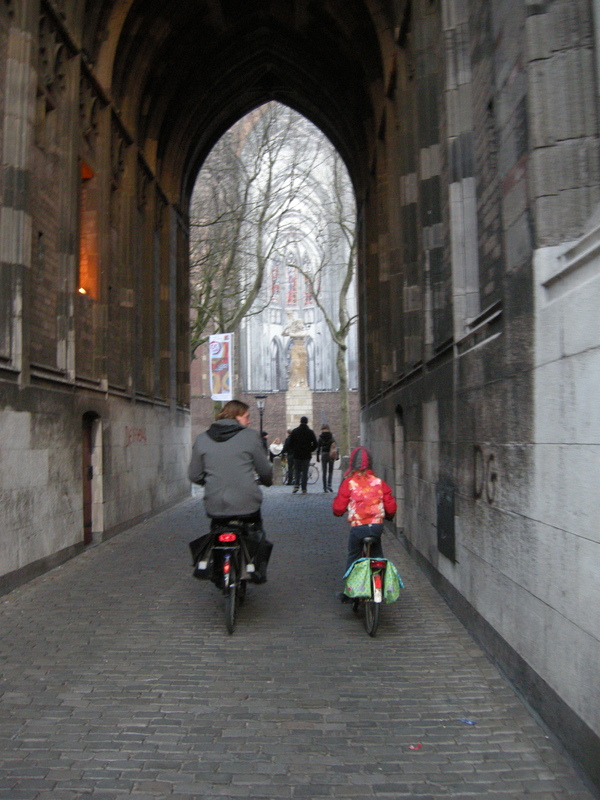 In Utrecht, it’s completely normal – no-one appears to bat an eyelid. That’s probably because everyone cycles, and a person on a bicycle in the city centre is therefore not viewed as someone too poor to afford a car, or a lycra lout, or an adrenaline junkie, and so on. 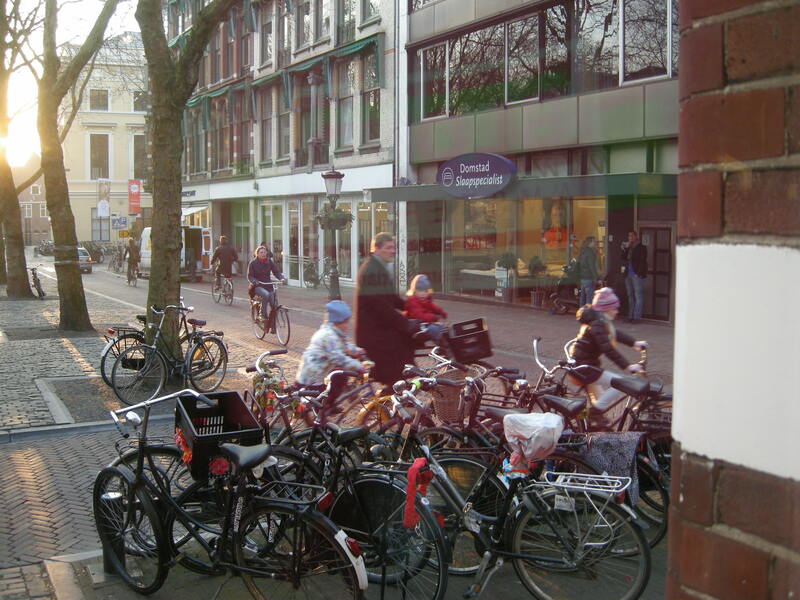 A picture of rush hour commuting, on my last evening in Utrecht. The next evening, I arrived back in the U.K., and the first cyclist I saw was a chap in a flourescent yellow jacket, helmet, glasses, lycra leggings, mounting a racing folding bike, with clipless pedals – ready to do battle with the rush hour traffic outside Horsham station. I don’t blame him – this is what you have to do to cycle here. I find that the least stressful way of getting about is to try to keep pace with vehicles, at least when I am forced to use the road – which is most of the time. And you have to wear a helmet, because you’ll probably be blamed if you get killed by a negligent motorist if you’re not wearing one. Ditto for hi-viz. But, please, can we not start making commuting by bicycle look a little more like the picture above? Is that not something to aspire to? 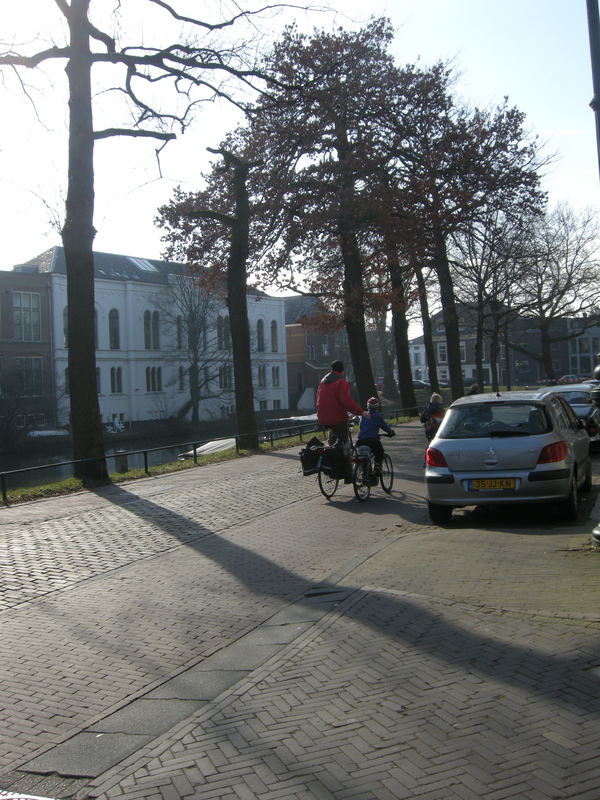 This entry was posted in Cycling policy, Infrastructure, The Netherlands. Bookmark the permalink. I’m very happy to hear that you enjoyed your visit. Sadly I didn’t get to see much of the outskirts – I was staying in a hotel just off Maliebaan (chosen by my partner, without knowledge of the significance of the street – she couldn’t understand why I was so excited, but I had seen your video about it! ), so that was about as far out as I got. I suppose Biltstraat, or Nachtegaalstraat, was the busiest street we visited, apart from a brief look at Catharijnebaan. But we plan to go back very soon – it’s a delightful city, and we want to explore more. Very depressing to be back in the UK – take a look at my post above this one, on Brighton, to see how what we are up against to get decent conditions for cycling, even in a supposed ‘Cycling City’. The council are proposing to *remove* a half-decent (at least by UK standards) separated cycle lane, barely two years after it had been installed, to improve ‘traffic flow’. We are decades behind the Netherlands. Pingback: The world’s best cycling cities - Top Stories Live!! glad you enjoyed your stay. It is also nice to go cycling outside of the city. There are multiple routes. Cycling is a leisure activity. By the way you will probably also enjoy Kopenhagen. Lots of people commuting by bike there as well, but they have slightly more regulations/ettiquete there. In the Netherlands many bicyclist do not follow the regulations. In fact it is not allowed to cycle on the pedestrian way. Reblogged this on Monoauralinc’s Blog. Sorry to reply a negative response, but I’m a cyclist who lives in Utrecht. And I can tell you that the last years there is a lot of discussion in Utrecht about the fact that cycling in Utrecht is dangerous (cars, busses, trucks), unhealthy (polution) annoying (road constructions) and anarchic. 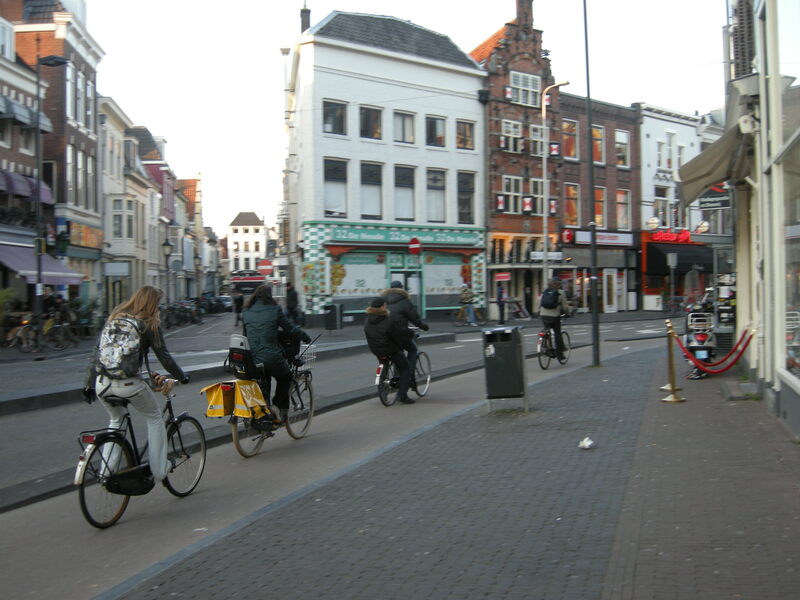 If you live here, you will find out that Utrecht is a bad place to cycle, compare to other Dutch cities. Specially for children. There are many accidents in Utrecht with cyclists, some with a sad result.